Like adult diapers, incontinence liners protection level varies by the product. 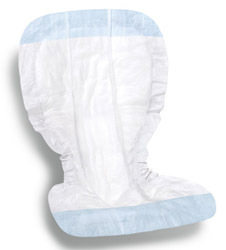 Incontinence liners are meant to be worn with a person’s underwear thereby reducing the bulk adult diapers cause. Liners are more comfortable; however, may not protect to the degree of diapers. This does not mean incontinence liners are inferior products. Liners simply have less surface area to cover the body. Today, technology has made liners effective protectors against incontinence. The price of incontinence liners will depend on the ability of the liner to absorb leakage and the thinness of the material. More and more companies are manufacturing better products that are thinner without sacrificing protection and comfort level. Depending on individual needs, liners are meant to protect against mild to moderate symptom levels. The key thing to look for in incontinence liner products is the ability to lock liquids quickly. In addition, you will want to find a liner product that provides good air circulation without sacrificing protection qualities. This will ensure your skin is comfortable and healthy.